Hypothesis: Our civilization, and any other civilization that will ever come into contact with us, will never invent backwards time travel. . .
. . . Because if it did, then time travelers would have infiltrated our past and present. Instapundit’s periodic musings on the subject get us thinking about this. 1. Our present is so insignificant that no future time traveler would bother to visit us. If time travel is invented thousands of years in the future, is it possible that our current civilization, from its beginnings until today, poses no interest, especially for a one-way trip? 2. There will be rules—based on civilization’s advanced, perhaps complete, understanding of relativity and quantum mechanics—and time travelers will be very careful not to make their presence known. Perhaps time travelers have already influenced our present, but we don’t know it, because each such an occurrence would create a divergence into a parallel universe. But wouldn’t they have left a trace in a more pedestrian way, such as someone appearing out of the blue, getting rich outside the bounds of believability by “predicting” the stock market, leaving behind some object that we cannot explain, or otherwise altering the course of observed events in a way that we could not explain scientifically? Assuming that backwards time travel is invented in the future, then it’s reasonable to assume that, sometime afterward, it would become widespread, leading to the likelihood of abuse. Or maybe our future is a totalitarian dystopia, in which a small band of elites controls all significant technology, and becomes adept at navigating through time to achieve its objectives without a footprint. Paradoxically, such elites would practically be gods, and perhaps they would then have no motivation to interfere much with the past anyway. It is at least conceivable that time travelers have affected our world and we don’t know it. But what about paradoxes—what if a time traveler traveled back in time and killed the inventor of the time machine, or Einstein before he formulated the theory of relativity, or the traveler’s own parents when they were children? We have no way to comprehend the impact of such a paradox. Which leads to our final counterargument. . .
3. Perhaps backward time travel will be invented in the future, but it will destroy our civilization, sometime after the present. We cannot imagine the social, political, and economic environment that must be prevalent in a society in which backwards time travel were widely available. But surely those conditions would post existential risk to the civilization. Maybe backwards time travel would be possible if, and perhaps only if, we were living in a computer simulation. Our programmers, who would have nearly infinite intelligence to foresee all possible implications simultaneously and thus to mitigate any uncertainty, would make sure that everything worked out and space-time remained stable. But then that wouldn’t really be backwards time travel in a universal sense. 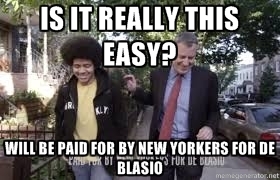 So all ultra-leftist Bill de Blasio has to do is trot out his afro-haired son in a shamefully contrived stunt to get blacks and white liberals eating out of his hand. How long after January 1 will it be until New Yorkers are longing for the past 20 years of law and order and (relative, by New York standards) fiscal sanity? If de Blasio wins, we’ll not be able to think of any truer example of citizens getting the government they deserve.